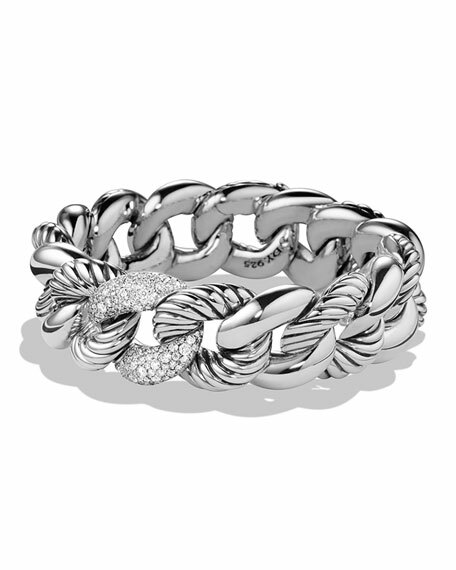 Madison medium link bracelet by David Yurman. Sterling silver polished and cable-motif links. Approx. 7.8"L; 0.4"W (11mm). Integrated cable-push clasp. David Yurman bracelet from the Madison Collection. Sterling silver cable links with enamel coating. Alternating enamel coated and cable links. David Yurman bracelet from the Madison Collection. Sterling silver cable links with enamel coating. Alternating enamel coated and cable links. Integrated push clasp. Approx. 8.5"L.